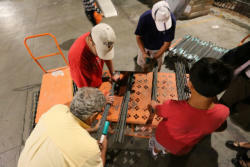 Sunday, October 26th, the Home Depot at Tustin and Taft in the City of Orange closed its doors at the end of the workday and then immediately opened them up again to their associates-turned-volunteers as well as volunteers from the Community Foundation of Orange. 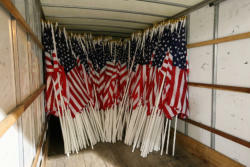 Assembly lines were set up to prepare the 1776 flags for the Field of Valor that will be held November 8th – 11th at Handy Park in Orange. 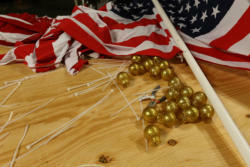 The two groups worked together that night cutting re-bar, drilling holes in pipe, then attaching flag toppers and the 3’x5’ flags, preparing them for the tribute cards - tied on with yellow, black, blue and/or purple ribbons - each with significance for the serviceman/woman being honored or remembered. 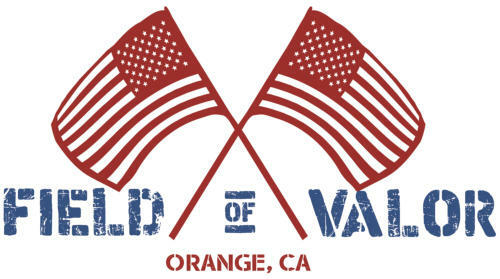 Not just an event for those in the City of Orange, the Field of Valor committee hopes that this event will touch the hearts and lives of citizens throughout all of Orange County and other parts of Southern California. 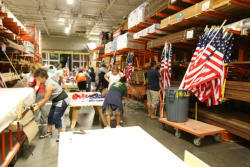 Flags have been purchased from those living in neighboring cities, with tributes being made to Veterans across the country and more orders coming in daily. 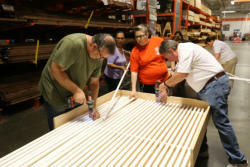 ​“We hope this is the beginning of a great partnership with Home Depot in serving together here in Orange,” voiced Remland. 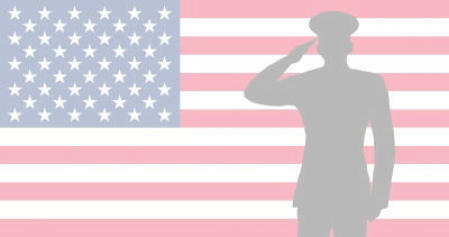 “I can’t say thank you enough for their commitment to this project as well as to the other individuals and businesses who have partnered with CFO in sponsoring the Field of Valor. This is exciting!” Fellow major sponsors Catherine Sorensen, Ashley Furniture Home Stores, Remland Insurance, Milan Capital Management, The RJ Noble Company, and Selman Chevrolet join the Home Depot in helping the Community Foundation of Orange make this Inaugural Field of Valor one the committee believes will be a pride-filled, patriotic event that will continue for years to come.From November 8th – 11th Handy Park (2143 E. Oakmont Ave, Orange) will be transformed into a sea of 1776 American flags, raising money for local active duty Military and their families, and Veterans, while honoring and proudly recognizing those who are currently serving in the military, those who have served, and those who paid the ultimate price, by giving their lives in service to our country.